Yeastar S-Series IPPBX supports DDNS which allows us to register the remote extension without having a static public IP. Dynamic DNS or DDNS is a way to update the Domain Name System (DNS) to point to a changing IP address on the Internet in real time. Register a DDNS account from above supported DDNS servers, and below I will use www.no-ip.com as the example. If you already have an account please skip this step. You just need fill in the hostname and don't need care about the IPv4 Address. If you create host successfully, you will see the following page, there is a free account so requires you to confirm your hostname every 30 days, if you don't want to be bothered you can upgrade account to Enhanced. 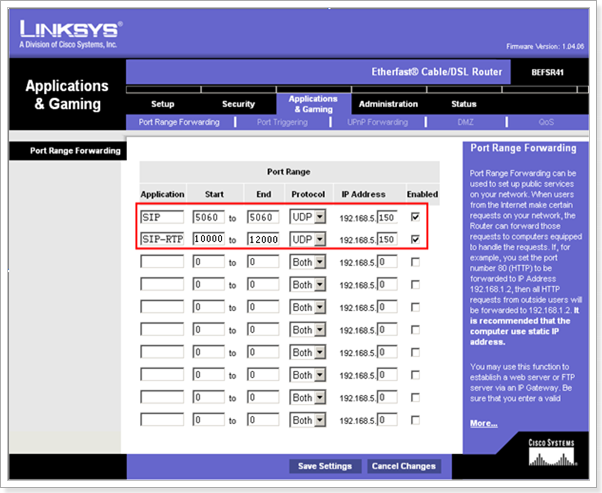 Below is the setting page in a Linksys router, we must map UDP port 5060 and UDP port 10000-12000. Step 1. Please go to Settings>System>Network>DDNS Settings to fill in your DDNS account info. Login Yeastar S-Series IPPBX web interface and go to Setting > General > SIP > NAT, and configure the NAT settings according to the directions below. Step 3. Setup up an extension in Yeastar S-Series PBX. (i.e. 1000). Step 4: Register the extension 1000 on the IP Phone which is setup in a branch office. Note: Server Host please please fill in your Hostname which created on www.no-ip.com.